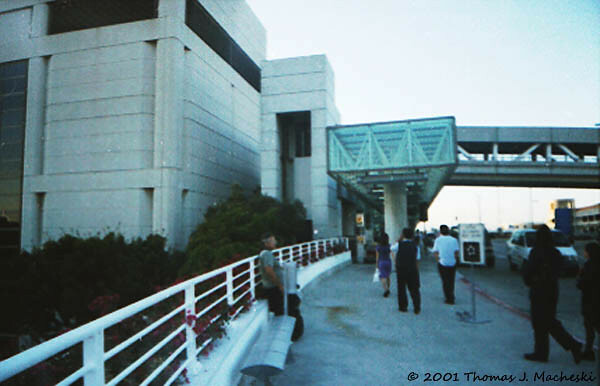 One Decade Ago, Today: a Retrospective - Ramblings of Mad Shutterbug & the Border Collie Bros. Fixed the mail checking problem; I needed to set the access via Internet to Yes. That fixed the problem. So international access to e-mail is operable, pending actual dial-up in New Zealand. We’ve watched but not listened to a silly movie about making hair-do’s, and eaten snacks and supper. Earlier on, lots of turbulance as we crossed over the weather front between Texas and Florida. It’s a lot smoother now. I’m just now firing up the box. I’ll read e-mail and keep this journal minimized. When I wind up for descent into Los Angeles, I’ll go to standby mode and let the box rest. Herself's parents took us to the Orlando airport to drop us off for the trip. We left Sydney Subaru Outback (then only one year old for us) at their place. A short flight to Atlanta, where we connected to LAX. This was, I believe, my second experience with LAX and it left very little good impression on me. Arrived in LAX a bit before sunset, and needed to change terminals. We walked, with only our carry-on bags so minimal luggage because our checked bags made it across via the airline luggage handlers. Remember this wee fact, please. Tried out a wee point & shoot 35mm Vivitar, which came as a 'gift' purchasing something else, I think some travel alarm clocks or some such. Probably my first experience with a camera made with a plastic lens, rather than glass. That's Herself resting on the guard rail, during a pause as we walked from the Delta terminal to the Air New Zealand one. Not sure why we walked other than dim memories that after sitting for the nearly five hours across continent and facing the even longer flight across the Pacific we wanted to stretch our legs. Time, some when between 20:00 and 20:30 I'm thinking. 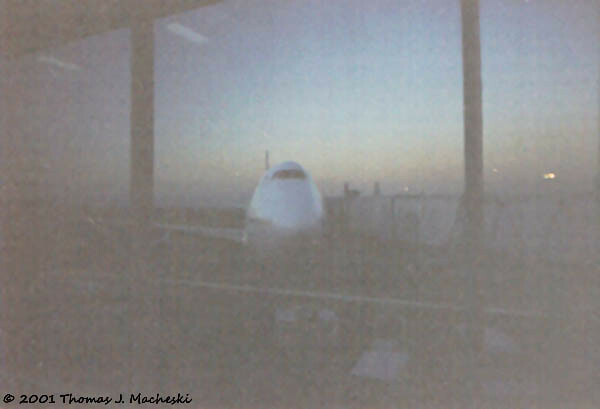 Air New Zealand 747 that carried us across the Big Pond, some when after 21:30 I expect as it is nigh onto sunset. I remember shortly after taking this photo (same camera mentioned above) that a big group of people started boarding, walking through a glass-wall separated hallway just off our waiting area. Turned out they were folk who'd arrived in LAX from other international origins and en-route to NZ. We boarded after they did, and took off about 23:00 or so. The next entry on this journey will be Thursday, and for a good reason as you'll see. This entry was originally posted at http://madshutterbug.dreamwidth.org/122023.html. Please comment there using OpenID.